This article zooms into the practice and historiographical implications of doing television history with women. Drawing primarily upon interviews with women having worked at Romanian television during communism, the article develops a conceptual understanding of ‘feminine voices’ as primary sources into television history. It situates these gendered historical sources within historiographical practices of accessing neglected, marginalized or silenced areas in television history, in other words, the ‘blind spots’ in the medium’s history. What do we gain by giving a voice to women in the writing of television histories and what would the practice of becoming inclusive of feminine voices in television historiography actually entail? In my research on the history of Romanian television under communism, female interviewees invited me into their homes, spoke about their private lives as television professionals, shared feelings, expressed anger, fear and passion as part of their remembering. Through their oral histories and life stories, these women offered access to a historical context that remained unarticulated by most of the male interviewees. It was primarily through the clashes, confrontations, denials and rejections that took place between me, as an outsider and women as direct participants to history that I have learnt to hear the silences and the unspoken in the history of a broadcast institution that emerged and matured during a repressive political regime. This article focuses on doing television history with women and attempts to theorize the historiographical practices and implications of that. It draws upon empirical data such as oral history interviews with current and former television professionals at Romanian Television (TVR), autobiographic memoirs and published interviews in the media. The empirical focus of the article – the context of TVR during communism – is relevant for the discussions at stake here. As a geopolitical area that until less than a decade ago has been neglected and at best, marginalized in television history, the case of television under communist regimes opens up broader incentives and understandings of how to tackle neglected, marginalized or silenced narratives in the writing of television histories: 1) it offers roughly unfamiliar grounds on which mainstream television histories can be rendered unfamiliar and challenged; 2) it draws attention to lacks and silences in television histories and historiographies; 3) it brings to the fore tensions and contradictions in television history prompted by the repressive context in which television in this geopolitical area unfurled; 4) last, but not least, it confront us – television historians – with going beyond the comfort zone of our mainstream historiographical practices. The article will start off by situating the practice of doing television history with women within existing television historiographies that have in one way or another focused on women. I will call these ‘gendered television historiographies’, so as to claim the focus on women making a specific contribution to the historical understanding of television. I will continue with unpacking the methodological implications of doing television history with women, asking how we can give voice to women as primary sources in television history and what that practice may actually entail. I will then zoom into three thematic ‘blind spots’ in the study of television history, which came to the fore through my dialogue with female interviewees at TVR and my struggles with hearing what these women had to say as they rejected, confronted or denied talking to me. This is an explorative article attempting to bring issues of gender and femininity in dialogue with discussions on historical sources and television historiography. What other narratives of television – other than histories of or about women themselves– can we gain access to by giving voice to women in television? How can we best give voice to women in the writing of television histories, a medium wherein women have been assigned secondary positions? It is perhaps no coincidence that in television historiography, it is primarily – yet not exclusively9 - female television scholars who have put on the map television histories dedicated to women, as evidenced also by the bulk of the works in this article. To give just a few examples, the founding members and coordinators of the Women’s Film and Television Network in the UK and Ireland have been exclusively female. Similarly, it was female scholars such as Rachel Moseley, Helen Wheatley and Helen Wood who set up and let the project ‘A History of Television for Women in Britain, 1947-1948’, which resulted in the edited collection ‘Television for Women: New Directions’. On another front, Anikó Imre10 wrote about socialist television for women, while Sonja de Leeuw and Dana Mustata11 wrote about continuity announcers as neglected professionals in television history. Other female television scholars, such as Amanda Lotz12 among others established themselves also through their feminist contributions to television scholarship. As previously mentioned, the core discussion here is one that has methodological and historiographical ramifications. The driving question is: how can we integrate neglected narratives – of women, in this case - into television histories and how can we do that without reproducing the antagonisms between dominant and marginal discourses, mainstream and alternative histories, centers and peripheries? How can we unearth these narratives in all their fullness, messiness, tensions and richness without filtering them through the lens of these dominant dichotomies? Several television scholars with a feminist agenda have already attempted to rectify and bring nuance to the roles that women have been assigned in television history. Rachel Moseley, Helen Wheatley and Helen Wood have reclaimed ‘women’s television’ as a cultural category in its own right – calling it a ‘rescue project’ - by theorizing and historicizing it as a genre and programming strategy closely tied to female personnel, whose richness and value have underpinned important cultural and social shifts. 21 In the edited collection, ‘Television for Women: New Directions’ (2017), contributors have pointed out to cult television drama as a platform for intervening into gendered identities and redefining hierarchies of taste,22 they’ve looked at women’s television as a symptom of shifting perceptions of female identities,23 as an instrument for interfering with feminist politics24 and have painted a more nuanced picture of the professional roles that women have played in the history of television production.25 The ‘Television for Women Dossier’ published in Screen in 2013, which includes the work of several other television scholars with a feminist agenda - such as Anikó Imre, Julia Hallam, Hazel Collie, Mary Irwin, Lynn Spiegel – took these discussions even further by reclaiming the cultural values and social function of ‘television for women’ in different national, regional and generational contexts. This article contributes to ‘rescuing’ women in television history and historiography, by focusing on women as participants to television history and their voices in narrating the history of the medium. This is an interventionist project meant to claim the multiplicity of voices, positions and understandings in television history, which co-exist within a heterogeneous framework of knowledge defined by contradictions, messiness, paradoxes and tensions; a framework of knowledge that goes beyond the binary oppositions that have only reinforced and reproduced the dominant, while keeping the dominated on the margins of television scholarship. While the article focuses exclusively on women’s voices, it argues that these voices are associated to cultures of femininity, which are not limited to women only. Male interviewees and eyewitnesses also contribute to what I will coin as ‘feminine voices’ in television historiography. Giving voice to women in television asks for new practices of doing television history. Such practices would act against appropriating women’s voices within dominant discourses of television history – ‘a pseudo-science of appropriating Otherness or a mere stir within the same frame’ as Trinh Minh-ha (1992) calls it28 - and instead, introduce these voices as multivocality, a multivocality that challenges, breaks and overthrows existent boundaries within the discipline. So is the practice of ‘speaking nearby’ as opposed to ‘speaking about’ women in television. ‘Speaking nearby’ is an anthropological practice introduced by Trinh Minh-ha in her documentary film ‘Reassemblage’ (1983). As Minh-ha points out, it is a way to ‘make visible the invisible’, a form of ‘indirect language’ that ‘does not objectify, does not point to an object as if it is distant from the speaking subject or absent from the speaking place. A speaking that reflects on itself and can come very close to a subject, without however, seizing and claiming it.’29 The result of it is the provision of an entry point into absences, silences, conflicts and contradictions and a point of departure for cultural – and in this case, historiographical – reflection. As the focus of this article is on speaking and voice, I have chosen to make hardly any use of visual material in the discussions here. This is to stay away from attempts of objectifying the female interlocutors that have served as inspiration for this article, while focusing on my own practice of ‘speaking nearby’ them. At the same time, the quotes transcribed are long and carry the signs of indirect speech. In my practice of interviewing staff who have worked at Romanian Television (TVR) during communism, few types of behaviour stood out among female interviewees: they preferred to conduct their interviews in their private homes; they expressed emotions during or before committing to the interviews, and last, but not least, they were much more receptive to life stories interviewing techniques than to semi-structured oral interviews. These types of behaviour may – at a first glance – be well too easily connected to cultures of femininity that are closely tied to emotionality, the realm of the home and the private sphere as well as to sharing of personal stories as a communication practice. However, much more than speaking about what may distinguishes female from male interviewees – a line of reasoning that is not of interest here and which would in fact, reiterate the same logic of binarism that runs at the core of mainstream television historiography – these types of behaviour exhibited during the interviews delivered upon analytical inspection unexpected, silenced or neglected historical insights. It is this that I want to focus on here. It was through the indirect language of emotionally charged responses that I have got to learn about the pains and traumas of former staff of Romanian television who have worked inside the institution during communism. Indirect language that is produced by ‘speaking nearby’ refers rather to ‘an attitude in life, a way of positioning oneself in relation to the world.’30 It is a practice of going beyond the spoken words, making the way words are spoken a point of inquiry so as to understand the absences and silences that lie beneath. My first ‘failed interview’ was four hours long. It consisted primarily of what I then classified as ‘gossip’ from the 1960s that painted the artistic scene in Bucharest at the time and the social circles some of the TVR employees would be active in. It was a type of talk that I initially dismissed for not having enough factual grip to it for historical research. The interviewee31 was a female programme maker and producer of entertainment programmes in TVR and had been active in the institution since the 1960s. This line of reasoning positions histories of television personnel and labour within the backdrop of lived cultures of the past, bringing television historiography close to anthropology: the anthropology of otherness in television, wherein otherness is represented through an unattainable, distant and long-gone past; through what remains unarticulated and left out by factual histories; and - in the case of former socialist broadcasters in Europe – through a demised political context that molded other ways of life and work. This anthropological take on television’s lived professional cultures positions the television of the past as a ‘society’ on its own that at the very least can sensitize historians to being reflexive of and accounting for any practices of appropriation, whether it’s appropriation into mainstream narratives or dominant discourses of television historiography. In this context, it is perhaps not paradoxical perhaps that it is through women as ‘secondary’ and oftentimes ‘marginalized’ members of this past televisual ‘society’ that we get to access this otherness. Nor is it paradoxical perhaps that – during my interviewing experiences – it was women who called out this otherness through their emotional responses and justified refusals to talk. No television historian has yet looked into the lingering traumas and pains of former socialist broadcasters in Europe. The article argues that is through female television professionals that we can begin to access these neglected and silenced phenomena of television’s socialist past; phenomena that have affected both male and female former staff. Attempting to understand the role of women in television history, the case of Romanian television under communism brings with it insights into a less known professional role: the role of the censor. ‘The text was irrelevant, it was pretty much the same text all the time’ she continued, referring to what she had to read out live on television as a continuity announcer. It was not the text that puzzled me, but the five stamps each piece of paper had on it, each stamp indicating the political filters and ‘visas’ that the text had undergone […]. I was obliged not to change in any way the original intended meaning of a sentence. I was very nervous before going live on air. I was in a state of constant stress, which looking back was not healthy for me. I was stressed first of all knowing that I was not allowed to step outside of the boundaries of what I supposed to say and to do. I was also stressed knowing that I had to treat the camera as if it was a person standing in front of me – easier said, than done. But mostly was stressed by the sounds around me. Next to me there was a secured window and opposite it, there was the control room. We could hear after the live broadcasting through the window if the editor-in-chief would call in – there was a short ‘bing’ sound accompanying those phone calls. When the President of TVR would call, there was a longer ‘bing’ sound. When that happened, we knew that we made a major mistake. All these sounds and the stress of it all caused anxieties in me […]. I was 22-23 at the time. […] And there was something else. For every mistake we made, we had a 5% or a 10% cut in our salaries for a week, depending on the gravity of it. The long ‘bing’ sound that announced a phone call from the TVR president, meant a 10% cut from our payment in the next month. One time [n.a. in the 1980s] after I was live on air, the president was calling the control room incessantly. Everyone looked at me asking what I had done. I told them, I had done nothing, I showed them the text that I was supposed to read out, which I followed strictly. It turned out he was calling because I was wearing a dress made by Romartizana that was identical to one owned by Elena Ceausescu. It was not my fault. I went to Romartizana and the women there recommended the dress to me as being superb. I had to change dresses immediately and I was forbidden to wear it again. I wasn’t punished for the incident as it wasn’t my fault, perhaps the staff at Romartizana suffered the consequences – they knew they had only made two dresses of that kind. That incident caused madness in the studio. Elena Ceausescu – the active participant in television censorship among the dictatorial couple – introduced another practice of censorship in Romanian television. It was the most direct form of censorship – one that emerged from the private sphere of the dictatorial couple and mirrored their viewing practices and tastes. Elena Ceausescu’s interference with television broadcasting was done by means of a ‘short phone line’. It was a short telephone number assigned to the dictatorial couple. Any phone calls from that number alerted the TVR employees that they were receiving orders or admonishments from the highest level. She called in anticipation of programmes, asking for last-minute changes in the programme schedule. She also called in the immediate aftermath of a programme that displeased either her or Nicolae Ceausescu in one way or another. The censorship measures that Elena Ceausescu applied to television programmes and television personnel no longer followed strict guidelines and institutionalized regulatory measures. They mirrored personal tastes, insecurities, jealousies and conflated egos that belonged to the private sphere of the dictatorial couple and which played a key role in engineer their personality cult in the 1980s. Often at times, they emerged out of scorn and personal vendettas. Famous in this case is the life story of Romanian actress Violeta Andrei who was forbidden by Elena Ceausescu to appear on television and was denied acting roles by her superiors on Elena’s orders. 49 The story goes that the dictator’s wife had strong feelings against the beautiful, elegant and talented actress, who was at the time married to Stefan Andrei, Minister of External Affairs at the time. Elena Ceausescu’s direct involvement in censoring television serves as a case study that opens up yet another neglected area of study in television history: the role of the female censor and censorship as situated within the private realm of emotionality. The previous discussion on Elena Ceausescu as a television censor not only points to a neglected profession in television history – one that emerges from the marginalized area of socialist television history – but it also points out to the diverse roles that women have played in television history. This diversity of roles becomes even more interesting from a historiographical point of view when it resurfaces as co-existent and concomitant – at times contradictory and paradoxical – experiences of television, a phenomenon that takes a step away from consensus-based dominant discourses of television history and calls upon non-linear and non-hierarchical histories of the medium. I argue that it is through their multi-faceted relations to and experiences of television that women’s oral testimonies and life stories speak of, which can offer access to these non-linear histories of television. Firstly, their professional parkour in television mirrored a fluid movement through different television professions. Starting with early television history, women climbed up the ladder and changed jobs within the same institution. The ‘feminine’ professions inside Romanian television under communism – by which I mean the professions predominantly populated by women and which does not - were the ones of continuity announcers and editors in charge of television montage. These professions provided a springboard for later career shifts that offer insights into the versatile contributions to women to television history. After 1990, Silvia Ghiata Ciurescu continued to make cultural programmes dedicated to dancing, such as Lumea Dansului (‘The World of Dance’) and later on, became a television producer of successful programmes, such as Mari Romani (‘Great Romanians’). Ciurescu’s professional trajectory in TVR is not of a unique kind. Carmen Movileanu, another female TV professional started out as an editor for the news department.51 In 1990, she was encouraged by another female television maker Cornelia Radulescu, to compete for one of the openings for continuity announcers. She was a continuity announcer until 1998, when the profession faded out from the broadcast institution, after which she continued as a programme maker in the entertainment department. Historiographically, this professional versatility that women in TVR displayed serves as a vantage point into looking at ‘feminine’ broadcast professions as multi-positional, wherein women have concomitantly occupied diverse professional identities, navigated a variety of skills and areas of expertise, moved through different departments and in doing so, they’ve and constantly redefined their relations to their co-workers and those in power. This multi-positional professional space that women have occupied in Romanian television under communism becomes an area of research that is conducive to accessing ‘the grey areas’ of television under socialism and the negotiations of power that took place. This multi-positional professional space is by no means exclusive to women, however, I argue that it has been rendered most visible by women and through ‘feminine’ television professions such as that of the continuity announcer, which became a springboard for further career advancement, dissolved and transmuted into other professions. The multi-positionality of women’s professions in TVR corroborates well with the diversity of social roles that women played in relation to television. 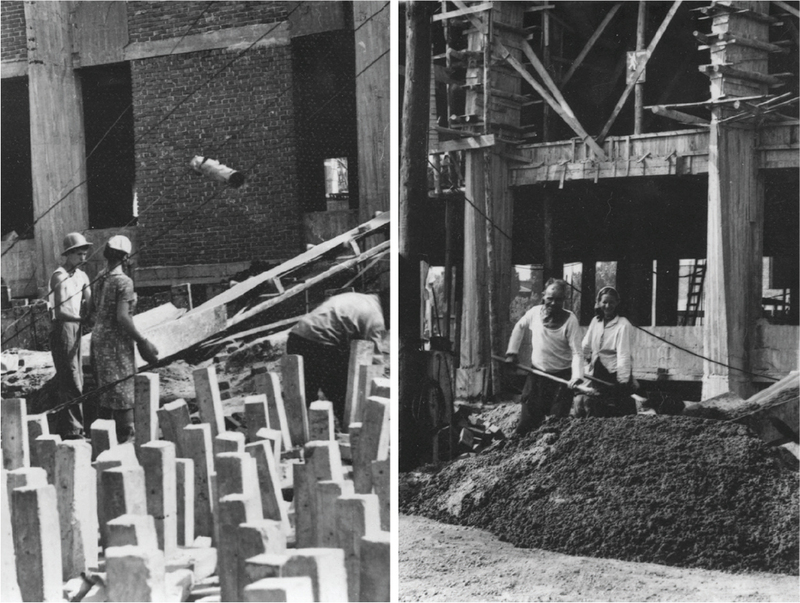 From Elena Ceausescu’s position as a female censor to female construction workers depicted on the construction site of Television Centre in Bucharest at the end of the 60s (see figure 1 and 2), women working in TVR occupied co-existing social roles. Figures 1 and 2. On the construction site of the Television Centre in Bucharest. ©TVR. They were citizens expected to live by example, especially female television professionals with visibility on the screen such as continuity announcers. Women’s fluid transitions through different television professions and the balancing out of different social roles points out to professional hierarchies in television as being unfixed and open for change. It shows television professions and professional identities as being multi-layered and singles out women as mediators of television’s fluidity between private and public spaces: the private spaces of the home, of motherhood and the working mother as well as the private spaces of emotionality and reactivity associated to television viewing as exemplified by the censorship acts of Elena Ceausescu; the public spaces of professional labour, social and political citizenship. It is the co-existence and concomitance of these multi-faceted dimensions of television that women in television help signal, that makes female television professions symptomatic of – and by extension, an entry point into - hybrid and perhaps non-linear narratives in television history. Treating women as primary sources in television history brings our attention to gendered entry points into historical narratives and the contributions these make to our understanding of television history. They offer insights into ‘feminine voices’ as primary historical sources that help render visible the ‘blind spots’ in television history marked by silences, lacks, contradictions, tensions and messiness. Feminine voices as primary historical sources reside primarily in the realm of expressive – at times confrontational - encounters with lived histories. They come to surface through denials, rejections, misunderstandings between the historian and her subject of study, through the blurring of boundaries between private stories and professional histories, the merging of television’s public and private spheres as well as through the historian’s coming out of her comfort zone. Such feminine primary voices in television history are not restricted to women only. Integrating feminine voices in television historiography brings about questions of (mis)appropriation of television’s other cultures, remote times and distant political, social and generational contexts. It sensitizes historians to reflect on their practices of inclusion and exclusion, in itself an act conducive to ‘rescuing’ neglected narratives of television history and redeeming these from the margins of the discipline. It is perhaps no coincidence, for instance, that the emerging area of (post)socialist television history in Europe has been pioneered predominantly – albeit not exclusively57 - by female television scholars58, as the case of European (Post)Socialist Television History Network illustrates. Feminine voices in television history bring to surface television’s cultural otherness, an otherness represented by other times, other generations, other regions and more often than not, professional cultures defined by other ‘languages’ and practices than historian’s own craft, to paraphrase Marc Bloch.59 This acknowledgement of television’s otherness may help put historians out of their comfort zone and inspire them to look outside their own set of historiographical practices to borrow instruments of understandings from other disciplines, such as anthropology, feminist or postcolonial studies. The added value of all this is the direct contribution to developing the conceptual and analytical tools to unearth neglected phenomena, professions and narratives in television history and restore them into a more inclusive television scholarship, one which collapses the logic of binarism that runs at the core of mainstream television histories. Dana Mustata is assistant professor in Media and Audiovisual Culture at the Research Centre for Media and Journalism Studies, University of Groningen, the Netherlands. She is co-founder of the European (Post)Socialist Television History Network and led the collaborative project ‘Television Histories in (Post-Socialist) Europe’ (2013-2016). She is the principal investigator of the project ‘Everyday matters. Material Historiographies of Television in Cold War Europe’, funded by the Netherlands Organization for Scientific Research (NWO). She is co-chair of the Media Studies Commission of the International Federation of Television Archives FIAT/IFTA.